Purpose: To create new invoices in the system at the corporate location. 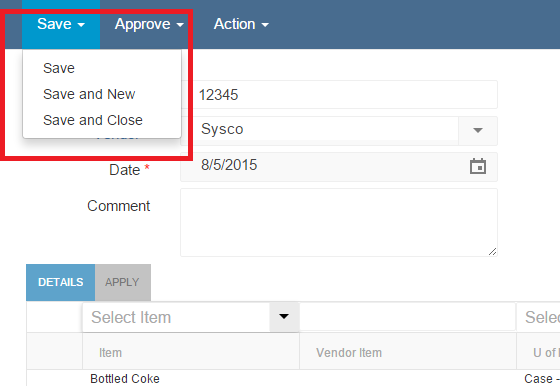 Create a new AP Invoice by clicking on the ‘Vendor Actions’ Tab in the top Ribbon, then select Invoice in the drop down. A new window will open with the name “Unsaved AP Invoice”. Note: If you are entering a large invoice, like a food invoice from your supplier, you may want to use the ‘AP Invoice Import Function’. This functionality allows the user to import a pre-defined template with your suppliers invoice details. 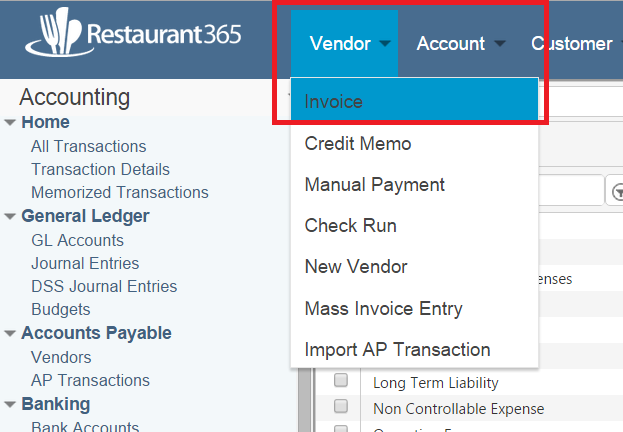 Click on this link to access the Importing An AP Transaction tutorial. Once you have selected a vendor, the system does a quick duplicate invoice check to see if the invoice has been entered before. If you have, it will give you a warning message and highlight the Number field in red. The next field is the 'Comment' field. 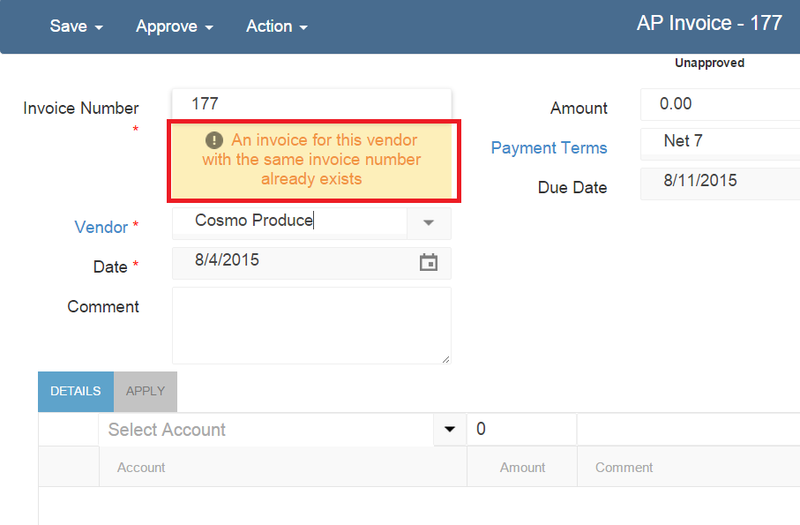 This is an optional field and is useful for adding additional notes to your AP Invoice. Comments appear in the 'All Transactions' and 'AP Transactions' lists and can be used for sorting and filtering purposes. Next up is the ‘Amount’ field. Enter the total original amount of the invoice before any discounts. As we tab through the fields we have the option to change the Payment Terms and the Due Date. *If the vendor is setup correctly, these values will already be populated for you. The Legal Entity and the Location default in from your user settings. You can change these based on which entity or location this particular invoice is for. If you assign a legal entity in one of the lines below different than the legal entity selected in the header, the system will automatically create the proper intercompany ‘Due To’ and ‘Due From’ entries. For the purposes of this simple AP Invoice Entry training, let’s keep everything in one legal entity. We will review the details of intercompany transactions in a separate training. After Location, the cursor puts us in the Credit Expected field. 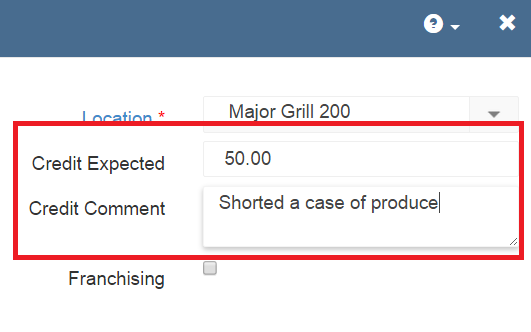 If the vendor has shorted you for any amount on a given delivery, put the amount of the adjustment in this field and add a comment as to why. Make note of the fact that the Unassigned Amount has now been reduced by this credit amount. The Unassigned amount is the amount remaining to be assigned to a cost category. We obviously don’t want the amount of the goods we didn’t receive to be included as an expense. Refer to the Credit Expected article for more information about how to use the 'Credit Expected' field on the AP Invoice form. Option 1 – If the vendor you have selected was set up for ‘Entry by Account’ you will not enter specific inventory items, but rather cost categories of the goods or services you are purchasing (ex. dairy, poultry, dry goods and so forth). Begin by typing in the name of the cost category you wish to assign first. The system will search for all categories that include the letters you typed in. Once you see the category you are looking for, click it and move to the next field. Enter the amount for this category and then put in a brief line item comment. The comment is optional. Next, insert the row into the grid by clicking ‘Add’. Notice that the amount remaining to be assigned is automatically placed in the top row ready to be allocated to a different cost category. Repeat the steps we just went through until the invoice amount (less adjustments) is fully assigned. You will know if you have done it correctly if the yellow ‘Unassigned Amount’ field disappears. Now that our transaction is balanced and all the required fields are filled in, select the Save & New button to enter another invoice or Save & Close to exit the screen. *As a helpful hint, ask your vendors to summarize their invoices at the bottom by category. They are often very willing to do this and it will speed up data entry for you. Option 2 – If the vendor you have selected is set up as ‘Entry by Item’ you will enter specific inventory items for the goods or services you are purchasing (ex: Milk, Shredded Chicken, Tomato Sauce, etc.). Begin by typing in the name of the item you wish to assign first. The system will search for all items that include the letters you typed in. Once you see the item you are looking for, select and move to the next field. You will see that the Vendor Item Number, U of M, Each Amount, and Account have been pre-populated based on the set-up information for this item. Enter the ‘Quantity’ for this Item. You will notice that once you entered the quantity the Total was automatically updated (Quantity x Each Amount). Next, insert the row into the grid by clicking ‘Add’. Notice that the amount remaining to be assigned is automatically placed in the top row ready to be allocated to a different cost category. Repeat the steps we just went through until the invoice amount (less adjustments) is fully assigned. You will know if you have done it correctly if the red ‘Unassigned Amount’ field disappears. Notice that the amount remaining to be assigned is automatically placed in the top row ready to be allocated to a different cost category. Repeat the steps we just went through until the invoice amount (less adjustments) is fully assigned. You will know if you have done it correctly if the red ‘Unassigned Amount’ field disappears. Now that our transaction is balanced and all the required fields are filled in, let’s select the Save & New button to enter another invoice or Save & Close to exit the screen.